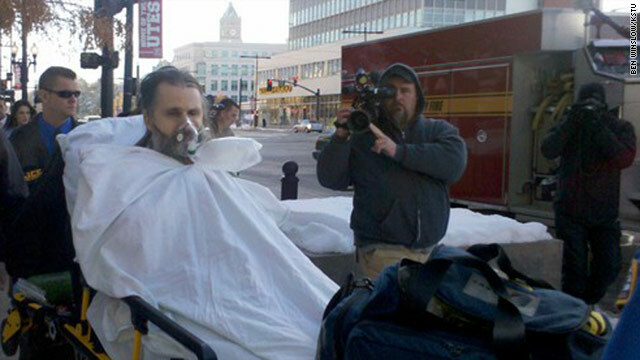 Brian David Mitchell, accused of kindapping Elizabeth Smart, is carted from the federal courthouse in Salt Lake City, Utah. (CNN) -- The federal trial of Brian David Mitchell, charged in connection with the 2002 kidnapping of Utah teenager Elizabeth Smart, was halted Tuesday after Mitchell suffered a medical problem in court, according to CNN affiliate KSTU. KSTU posted a picture on its website of Mitchell, wearing an oxygen mask, sitting on a stretcher as he was being loaded into an ambulance. Mitchell, as usual, began singing when he was led into the courtroom Tuesday: "O Holy Night," KSTU reported. U.S. District Judge Dale Kimball began the proceedings by raising an issue in a note sent from jurors. As Kimball asked for jurors to be brought in, Mitchell began to wail and dropped to the floor, KSTU said. Defense attorney Wendy Lewis told Kimball, "He's having a seizure, your honor." An ambulance was called, and paramedics came into the courthouse to examine Mitchell, according to KSTU. "The judge told the jury that an issue had come up and the trial would be suspended today," Melodie Rydalch, spokeswoman for the U.S. attorney in Utah, said in an e-mail. Kimball told jurors the trial would resume Wednesday, KSTU reported. Rebecca Woodridge, Mitchell's stepdaughter, told KSTU he has suffered seizures before. "He's had a few of them in the past year. I don't think there's any reason for him to fake this," she said. Defense attorney Robert Steele told reporters outside the courthouse that Smart herself had testified about Mitchell suffering a seizure during her time in captivity. "We watched a seizure," he said, according to KSTU. "It really happened." Mitchell, 57, faces charges of kidnapping and unlawful transportation of a minor across state lines in Smart's abduction. Then 14, she was kidnapped from her bedroom in her family's Salt Lake City, Utah, home. Nine months later, she was found in the company of Mitchell -- a drifter and self-described "prophet" who called himself Immanuel -- and his wife, Wanda Barzee. Mitchell's trial resumed Monday after taking last week off. Barzee earlier testified as a defense witness. Defense attorneys are mounting an insanity defense for Mitchell, hoping to prove that mental illness clouded his mind to such a degree that he did not understand that his actions were wrong when he abducted and held Smart. CNN's Ashley Hayes contributed to this report.